The content of Private Collections is amazing. Made me realize more the beauty, richness and depth of Filipino Art. I am just starting my own collection and this book inspired me to explore further what the Philippines has to offer especially in the area of Contemporary Arts. Looking forward to the next book. This is the latest addition to my collection of art books. Congratulations! I like this book very much because it makes the readers like me appreciate the collector being talked about. You just don't ravel at their collections but their journey to art collecting is what I appreciate the most. What I like about this book is that it is not a guide book that teaches and preaches readers on how to collect. Rather it gives an inspirational stand that anybody can collect and form a collection. This is a simple but good book. A unique addition to my private library. My family and I are very happy to acquire this book when we were in Manila this March. We brought it here in Daly City and shared it with our Filipino relatives and friends. We are very proud that a book of this kind was published that made us miss our birth country, the Philippines. I have fond memories of Philippine art when I was still living in the Philippines during the 1970s. Fernando Amorsolo was popular then and still is now. The young ones doing Western art is also good. This means that Philippine art is growing and heading towards a new direction. I will not say Congratulations that this book was published but a big Thank You for doing the Filipinos abroad a favor. God Bless the Filipinos and the Philippines! This is the most beautiful cover in an art book I've seen. The only fault this book and the shipping has is that it is pricey but my friend has this book and I finally saw everything inside the book. This book is a winner. What a work. What an effort. A Big Congratulations to the team behind this. You have put the bar high in terms of publishing art books in the Philippines. Finally, we can compete with the other art books internationally. I'm looking forward to your company's upcoming publications. Please cover some Filipino art collections here in the East Coast. My friend recommend me this book. I have read half of its content. The stories and the lives of the collectors are so interesting that while I was reading it, I almost forgot that it was an art book. I became absorbed with the stories of the collectors and the beginning of their collecting years. I like the fact that I was able to learn about their lives even if some of them own a "not so great" collection. This is one book that will never be forgotten. It is unique in its own way and I like it. This book offers a juicy combination -- the collectors' biographies, a sort of a walk through their private art collections with insights on collecting. What a wonderful way to appreciate art through the art collections of others. Some of the stories of these art collectors are inspiring namely Eddie Chua, Joven Santiago, Washington Sycip and Charlie Cojuangco. But there are also those who gave intelligent insights namely, Alexander Tan, Norman Crisologo, Ester Gabaldon, Cesar Duque, Hans Sy and Gilbert Santos. I also think that the book is beautifully laid out and is easy on the eyes of any reader.The quality of the paper used is also high and the writing is intimate and inspiring. Private Collections is the book of the year. Congratulations! Really well done! The real deal about this book is that QUALITY MATTERS. 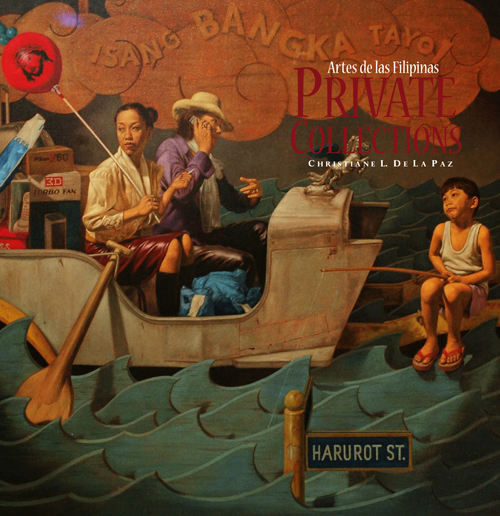 In this case, Mikee Romero, Ester Gabaldon, Evelyn Dy, George Ty, Hans Sy, Eddie Chua, Washington SyCip, David Consunji, Patrick Reyno and Manolet Salak have the best private art collections. But reading each story of formation and acquisition, I must say Joey de Leon exemplifies the BEST art collector. Second is Cesar Duque. Third is Hans Sy…I was also impressed by the art collections of Joel Butuyan, Norman Crisologo, Wilmer Hontiveros, Gilbert Santos, Charlie Cojuangco and Mark Villar. QUALITY COLLECTORS, QUALITY COLLECTIONS, QUALITY BOOK. I had assumed that the book is any regular art book and that the owners of the art were providing the readers with no more than a privileged view of their collections. The art came first and the owners came second. How wrong I was. This book is about the collectors and the art is merely a vessel used to provide an insight into their inner being, defining who they actually are. This is what makes this book so fascinating and unique. Its human nature to want to know what makes a successful person tick, what drives them, their aspirations, what makes them happy, what makes them sad and what better way to uncover these truths but via the art collections they own. What I enjoyed most was the fact that everything that was written in this book is relevant to every reader. Collecting transcends financial status, social standing, gender and race. We are all collectors and anybody who claims they are not, just hasn’t realized it yet. For this reason, the book has tremendous appeal to all those lucky enough to own a copy.